Model: A60 Cambridge (ADO38) OHV 8v 1622cc. Type: 4-Cylinder Countryman Estate Manual. Colour(s): Dark Grey / White. MOT Expired: 14 July 2011. 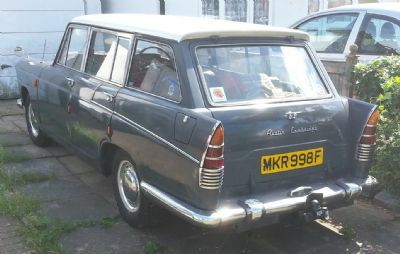 According to www.newreg.co.uk This registration was first made available in 1968. The original office for this letter combination is Kent C.C. MKR 998F Austin A60 Cambridge (ADO38) OHV 8v 1622cc. 4-Cylinder Countryman Estate Manual. England Zak Pearson.